Ivory Noche, under jockey Damian Martinez, setting the fastest time in Saturday's John Deere Retama Juvenile Challenge at Retama Park. Ivory Noche Tops John Deere Juvenile Trials at Retama Park SELMA, TX�JULY 29, 2017�K and W Land and Cattle Co.�s homebred Ivory Noche rolled to a 1� length victory in the second trial Saturday to post the fastest time for the John Deere Retama Juvenile Challenge. Ridden by jockey Juan Garcia, Jr., Ivory Noche, a son of Ivory James out of the Tres Seis mare Tres Dia Noche broke from the far outside post, driving to the top mark of :17.723 seconds, a 99 speed index. 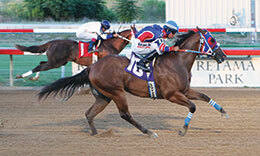 Brian Stroud conditions the bay gelding, who picked up his third win from five starts this evening. Sent off as the even-money favorite, Ivory Noche paid $4.20 for the win. The final will take place on Saturday, August 12 with the winner advancing to $130,000 John Deere Juvenile Challenge Championship (G2) at Prairie Meadows on October 14. For the complete list of John Deere Retama Juvenile finalists, their times, sires, dams, owners, breeders, trainers and jockeys CLICK HERE.